New downtown location will help expand visibility in the community, provide additional office and recreational space for program. INDIANAPOLIS (Aug. 30, 2018) – Big Brothers Big Sisters of Central Indiana (BBBSCI), a non-profit organization that provides children facing adversity with strong and enduring, professionally supported one-on-one relationships that change their lives for the better, today announces the acquisition of a $1.8 million building that will be the new home of the organization. In partnership with CORE Planning Strategies, Rowland Design and Capitol Construction Services, BBBSCI will begin renovations on the 20,000-square-foot facility, located at 1433 N. Meridian St., by mid-October. The building renovation is expected to be complete by April 2019. 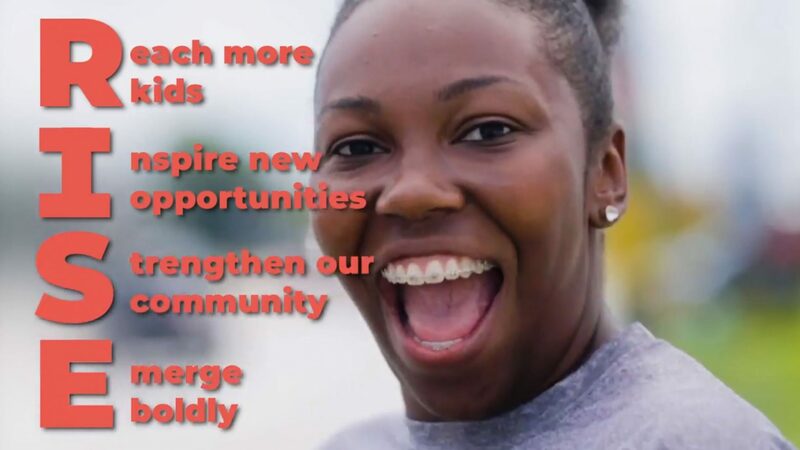 The new location is part of the $7 million RISE—Reach more kids, Inspire new opportunities, Strengthen our community, Emerge boldly—campaign, which furthers the mission of BBBSCI and continues to help transform the lives of children and the community. This initiative stems from a five-year strategic plan to amplify recruitment, retention and support of both Bigs and BBBSCI employees to reach the program’s goal of serving 1,500 children in central Indiana. The two-story building will serve as a mentoring hub for the community, offering much needed space for mentor trainings, program activities and an increased staff capacity. The building will also feature racing slides for Bigs and Littles. To learn more about BBBSCI and how to get involved in the organization, visit www.BeBigForKids.org/RISE or click here. Big Brothers Big Sisters of Central Indiana will serve 1,200 youth this year by providing them with mentors (Bigs). BBBSCI partners with parents, guardians, volunteers, schools, donors, and others in the community to be accountable for helping youth in our program achieve higher aspirations, greater confidence, educational success, and avoidance of risky behaviors. An affiliate of Big Brothers Big Sisters of America and a United Way partner, Big Brothers Big Sisters of Central Indiana is a non-profit organization that provides children facing adversity with strong and enduring, professionally supported 1-to-1 relationships that change their lives for the better, forever. CORE Planning Strategies provides program management skills that help organizations develop and drive strategies to increase their efficiencies, achieve their ideal capital improvements, and transform their communities. For more information, visit http://coreplanningstrategies.com. Founded in 1968, Rowland Design is an award-winning studio of talented architects, graphic and interior designers. With projects from Los Angeles to Brooklyn, Rowland’s services include architectural renovation and new construction, interior design, project management, construction administration, space planning, building programming, furniture and finish selection, move coordination, and historic preservation. Rowland Design also provides signage and wayfinding design, art programming, lighting design, and facilities assessments. Rowland Design is certified as a Women’s Business Enterprise. Based in Fishers, Ind., Capitol Construction Services Inc. is general contractor that was established in 1998. Today, the company employs nearly 150 associates out of offices in Fishers, Plainfield, Ill., and Franklin, Tenn., and can perform work in 46 states. Having grown through repeat and referral clients, Capitol Construction specializes in working with property owners, developers, retailers, auto dealers and non-profits. The team has established strong subcontractor relationships and can self-perform Division 9 work.